Great shots! I recently bought a 60cm frame like the one pictured along with a few parts. I used to have a similar bike, maybe a 61cm, but with only 2 chrome bands and an unpainted brass badge. It had Magistroni cranks and Gran Sport hubs. Both were the same color emerald green. How do you know this is a 1964? What kind of seat did it come with? Everything about this bike matches the Bianchi in blue I purchased at Harvard Square, in fall of 1965, for $180. 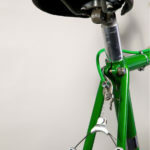 The only difference: paint color is dark blue, and saddle is a Brooks with steel rivets (not enlarged copper). Original tires were Pirelli– not sure of size. Loved the sound of the tires at 120 psi on new asphalt roads, while on training rides & one or two collegiate races near Concord and Carlisle Massachusetts. 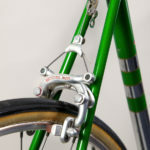 My 1964 tangerine Specialissima does not have an allen key TTT front stem. I believe the original Specialissimas had exposed hex bolts. I believe the originals did have an exposed hex bolt, as this is what mine has. I’m still trying to date my bike, which I acquired through a swap meet many years ago. Mine is all black. 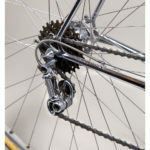 Do you have any insight into how one is able to determine what year their bike was made? I’ve heard reference to a Specialissima 2, as well. I’m also looking to restore my bike. If anyone has any suggestions of where to start, would be much appreciated. I’d probalby need to get my bike re-painted with new decals, cabling and break hoods, but the bike is generally in pretty good condition and I still ride it. 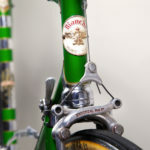 The headset is just listed as “Bianchi” but I think it is probably Campagnolo. 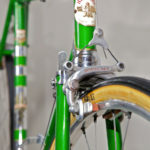 Bianchi’s cool bulged-headlugs and internal headset are not unique; there were other Italian brands with almost (or in some cases exactly) the same thing. Bianchi used it as far back in the 1930s I believe, maybe farther back than that. I’m no expert. The headsets were made by various manufacturers, including Magistroni. Steven Maasland once told me the whole list of headset brands that went into Bianchis but I forget now. My Specialissima is probably ’61 to ’63 and I lean toward the earlier date due to some of the components on it. The headset in it is definitely Campagnolo, based on the logo and the ground/polished races. Unfortunately you have to knock the races out of the frame/fork to see the logo. Other Bianchi’s I have opened up had headset races with a V-groove top and bottom (similar to some old Stronglight headsets) rather than the more familiar cup-and-cone shape. In a V-groove headset, the balls touch 4 places, 2 places each on the upper and lower grooves. The Campy headset in mine is a regular cup-and-cone where the balls touch only one place per race. I don’t know which models/years got the Campy headset and which got the inferior (in my opinion) V-groove headset. Anyone who knows for sure which headset is in their bulged-headlugs Bianchi should post back so we can get some more data points. 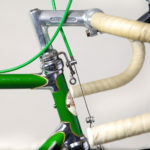 I know even the top of the line Folgorissimo in the 50s had a V-groove, as did the ’64-’65 Gran Sport (a cheaper model), so the Campy might only be on early-60s Specialissimas and Competitiones. 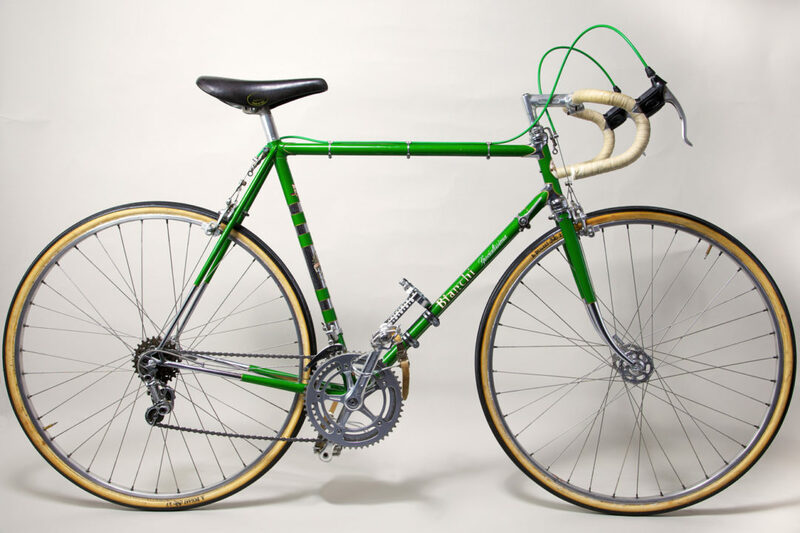 I have recently acquired a ’65 Specialissima from the original owner and it very closely resembles this one except it is black. It was owned by a retired German mechanic who passed it to me in near perfect condition. 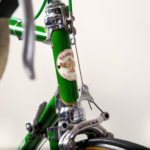 That said I would love to restore at least the Specialissima decals which have all but worn off. So far no luck in finding these. I am waiting to install some sew ups on it and hit the road. 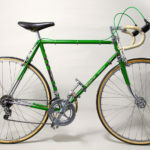 I just scored one of these specialissima bikes at an auction I was told it was a 64 black with the bulge style lugs etc. Nice shape worng original saddle what was correct? I paid $300 whats a current value? 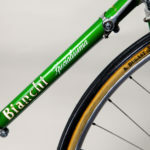 Not for sale at this time..
Just got a vintage Bianchi. Its really clean, so I took some picture for the community. Its pretty much all original. Mark, I have had two Specialissimas, and a cheaper model (San Remo I believe it was). One with a 60 (1960?) 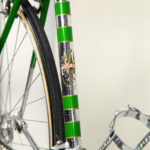 in the serial number had the round brass headbadge and two chrome bands on the seat tube. 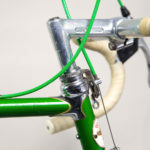 The other, with a 64 had the round anodized and painted aluminum badge and four bands, also an oiler back of the head tube. All three had the bulging lugs with “V” grooved races, though they were cruder on the cheaper model. When replacement races are too thin, rather than file down the lugs, why not simply install shims of the right thickness? I would think brass would be best, but you could cut thin washers from beer cans and insert them behind the races. I have 2 like new 1984 LEGNANO BICYCLES WITH GARELLI BABY MOSQUITO MOTORS FOR SALE. USED 5 HOURS EACH…STORED IN WAREHOUSE. THANK YOU. 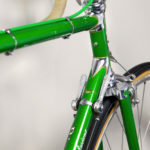 So I am no expert but I have a awesome vintage Bianchi Road bike. It came with sew on tires and a campy pump. The bike has the same beautiful lugs as the specialist ones but mine has this funky yellow tape letters on it. It has a big B on the front, then “Bianchi” going down the side, and “Stoney” along the top tube, and “BLUE” going down from the seat. I am very confused about what this bike is, so if you can help in any way, please let me know!